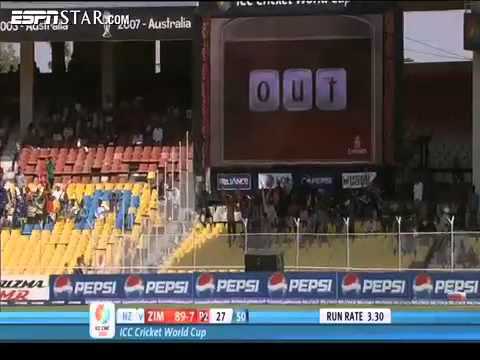 Watch New Zealand v Zimbabwe ICC Cricket World cup 2011 match Video Highlights. NZ vs ZIM match video highlights will be placed below soon after live broadcast of match. New Zealand beat Zimbabwe by 10 wickets in the ICC Cricket World Cup, group A match. Kiwi openers Martin Guptill and Brendon McCullum remained unbeaten to go past target of 162 set by Zimbabwe. Here are the highlights. Zimbabwe were the one to lose all the wickets in the match against New Zealand in the ICC Cricket world Cup, Group A match. Zimbabwe were all-out for 162 whereas, the Kiwis lost no wickets in pursuit of the modest total. Dont forget to watch video highlights of the match which is played between Zimbabwe & New Zealand teams?